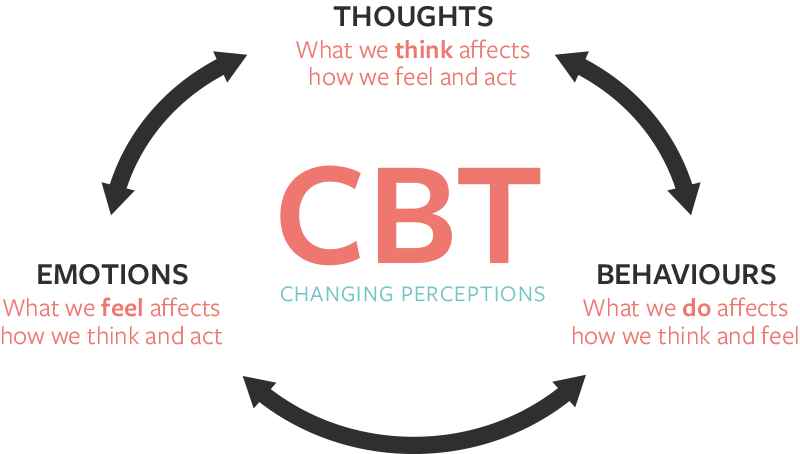 Cognitive Behaviour Therapy (CBT) is a form of talking therapy that combines cognitive therapy and behaviour therapy. It focuses on how you think about the things going on in your life – your thoughts, images, beliefs and attitudes (your cognitive processes) – and how this impacts on the way you behave and deal with emotional problems. It then looks at how you can change any negative patterns of thinking or behaviour that may be causing you difficulties. In turn, this can change the way you feel. CBT tends to be short, usually attending attending a session once a week, each session lasting an hour and then moving to fortnightly. Together with the therapist you will explore what your problems are and develop a plan for tackling them. You will learn a set of principles that you can apply whenever you need to. You may find them useful long after you have left therapy. CBT may focus on what is going on in the present rather than the past. However, the therapy may also look at your past and how your past experiences impact on how you interpret the world now. What type of problems can CBT help with? CBT does not claim to be able to cure all of the problems listed. For example, it does not claim to be able to cure chronic pain or disorders such as chronic fatigue syndrome. Rather, CBT might help someone with arthritis or chronic fatigue syndrome, to find new ways of coping while living with those disorders. Thank you so much for the support and guidance. It’s really helped to build my confidence, set personal goals and be assertive. I now can go out with friends, enjoy life more and look forward to the future. I have found therapy has changed my life. I no longer feel disconnected from the world, on my own and isolated through EMDR. I have made sense of the traumatic events in my past and now look forward to the future with optimism. Thank you so much for working with my 15-year old daughter. At school she suffered a great deal of anxiety because of exams and this affected her confidence with friends, her self-esteem and she found it hard to manage her social-media. As a result of therapy, she effectively can manage stress due to exams, her self-esteem has improved and she now deals with social media in a more resilient manner. Need to talk? Want to book a consultation? My practice is in Glazebury, Warrington (near to Bents Garden Centre) which is in easy reach of Warrington, Lymm, Leigh, Newton-le-Willows, St Helens, Worsley, Walkden, Astley, Lowton and Golbourne. I follow the ethical guidelines set out by the BACP, EMDR, BABCP and ACTO professional bodies working with both adults, young people and children.